Hercules goes to the Underworld! 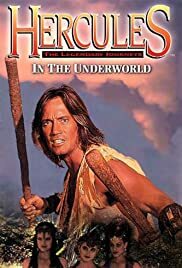 This is the fourth pilot TV movie that jump-started the "Hercules: The Legendary Journeys" TV series, where Hercules (Kevin Sorbo), now married with children, goes on a quest to save a village from an evil presence coming from underground, which turns out to be a portal to the Underworld. The plot of the movie goes at a fast pace and is action-packed, full of Hercules vs. bad guys scenes and also full of adventures in a host of settings, including the plagued village, Hercules' home, the forests, Tarturus and the Elysian Fields. In addition to seeing the excitement of Hercules' unending adventures, there are also a nice touch of dramatic and heartfelt moments between Hercules and his family, mysterious suspense surrounding the cunning centaur and the unforgiving coldness of Hera's evil ways. The New Zealand countryside setting is refreshing and the costumes are colorful and vibrantly done. The music score by Joseph LoDuca is very catchy and the acting is pretty spot-on, with a good dose of humor, though I don't quite get why Hades, God of the Underworld, is portrayed as a semi-geeky character wearing a white toga - not menacing or frightening at all! Overall, it's another fun Hercules TV movie - good action and adventures!